Our holders are a perfect add-on to any coaster set purchase. Enhance the look of your coasters by displaying them in a wide variety of available holders. 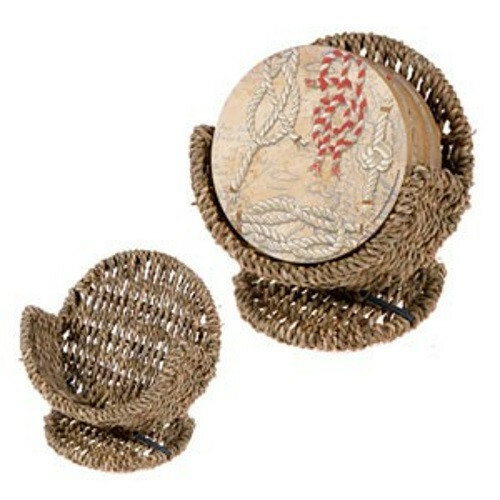 We offer something for everyone's tastes, whether it be seagrass, wrought iron or our solid wood holders. When paired with our sandstone coasters, holders create a wonderful and funtional accent in any room in the home or office. Each holder accommodates a set of four sandstone coasters. Our holders are a perfect add-on to any coaster set purchase. Enhance the look of your coasters by displaying them in a wide variety of available holders. We offer something for everyone's tastes, whether it be seagrass, wrought iron or our solid wood holders. When paired with our sandstone coasters, holders create a wonderful and funtional accent in any room in the home or office. Each holder accommodates a set of four 4" x 4" or smaller sandstone coasters.